Detroit native LaVice Hendricks studied acting after a stint in the US Navy, but soon turned to his primary passion: writing plays and screenplays. In 1969, he began his own theater company based at Detroit’s Bethel A.M.E. Church. Four years later he moved on to larger productions, culminating in his first musical, “Two Sisters from Bagdad.” His younger sister, Rhodia McAdoo, a church singer and pianist, composed the score, while brother-in-law Ernest J. Garrison added the lyrics and arrangements. As one might expect from a play that gestated in a church, the plot revolves around love, sin, heaven and hell. While the play ran for just two weeks in August 1973, Hendricks did press a soundtrack album in extremely limited quantities. Years later, it became known primarily amongst record collectors who coveted one of handful of known copies. Thanks to Jazzman Records, the long lost album has been reissued for the first time. As a stand alone soundtrack it has its drawbacks, namely a raw performance obviously recorded with minimal takes in a rough mix, but one might say the musicians make up for it with their enthusiasm. Though its difficult to follow the story line, the music combines a raw gospel vocal style with jazz-based instrumental accompaniment. Things pick up with the ethereal “Fantasy,” featuring a male soloists and female backing chorus over a flute ostinato and sax riffs. One of the highlights is the funky “Thoughs Were The Days,” presumably featuring Garrison as the “Agent of Hell” in a swaggering song heavily influenced by the Blaxploitation films of the era. Another is “Satan Baby,” sung by a female vocalist over a driving bass line accented by bongos and sax. Of course the devil can’t win in this story, so the final song, “Yes I Do,” is a sunny gospel-pop number with an angelic chorus. Closing out the album is the title track, another funky instrumental but with a rather repetitive theme. Two Sisters from Bagdad is a quirky, homegrown production that’s certainly more of a novelty. However, since the soundtrack appears to be the only aural documentation of LaVice Hendricks’s musical, it does offer a glimpse into the output of this little known playwright from Detroit. 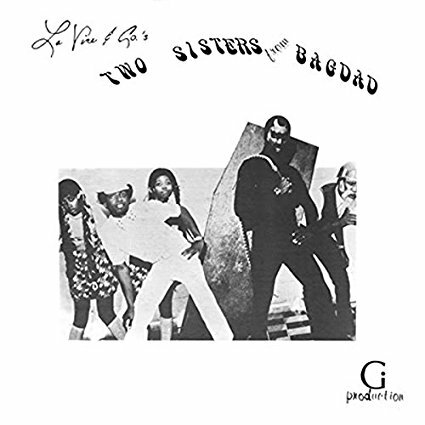 This entry was posted in Rhythm & Blues, Soul, Funk and tagged Bethel A.M.E. Church, Brenda Nelson-Strauss, detroit, Gospel, Jazz, Jazzman Records, LaVice & Co., LaVice Hendricks, Two Sisters from Bagdad by aaamc. Bookmark the permalink.